The Azores is one of two autonomous regions of Portugal, and is comprised of nine islands 900 miles off the coast of Europe. São Jorge, one of our three rare cheeses this month, hails from none other than the island of São Jorge. Its history is embedded in the rich story and traditions of the island where the cows graze freely in lush pastures and are hand-milked twice a day. The evening milk gets delivered to the creamery at roughly 8:30 at night and cheese is produced into the early morning. Milk doesn’t get much fresher than that. Only one creamery is allowed to produce this D.O.P. 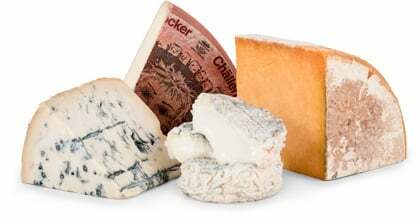 cheese, which can be sold at 3, 4, and 7 months. You’ll have the opportunity to sample the extended-aged “Sete Meses” 7-month product. This a raw milk cheese and the cows are entirely grass fed. São Jorge a slightly larger format cheese weighing in at 20-22 pounds per wheel, and the bright yellow paste is creamy with many little 'eyes'. The distinctive flavor profile is both tangy and vegetal/herbal. São Jorge is cheddary, with tangy, spicy undertones. It pairs very well with fruits and is a great snacking cheese. 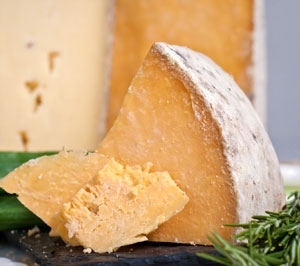 Milder in flavor, it will go nicely with lighter ales and lagers as well as dry red wines.